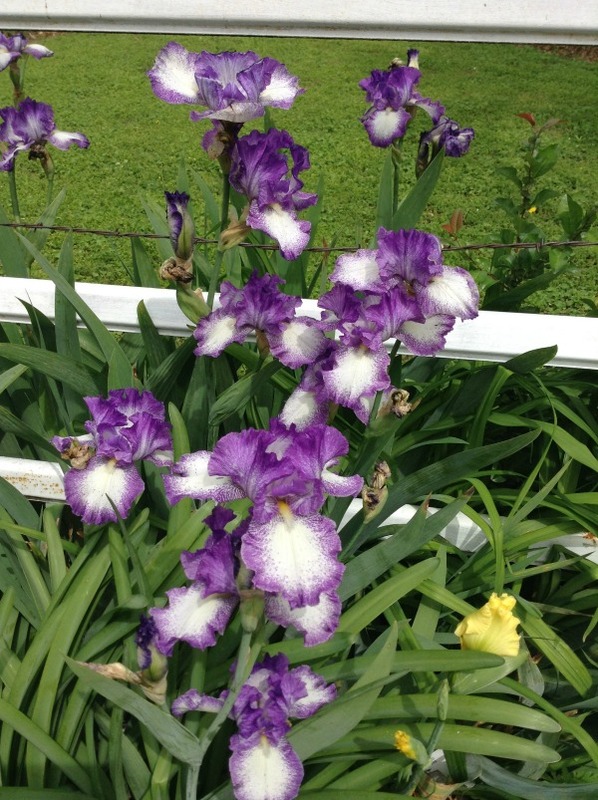 Dig This – It’s Iris Season! Here is the latest Dig This column from Diana Sellers – regionally famous Grand Lake gardening expert, co-owner at The Artichoke and engine behind The Saturday Morning Market at The Artichoke. Well, you can tell it is gardening season at Grand Lake because my hands look like a farmer’s hands! I abuse them enough working in the Artichoke kitchen because of the amount of times we wash our hands. Then I wear latex gloves in the garden because it is almost like not wearing gloves and you can feel what you are doing and there is less breakage of stems, etc. but they don’t protect the hands as good as a thick gardening glove. But I have some great Mary Kay stuff for hands! We were open Saturday morning for the market but we were not super busy so I took advantage of the time and planted the buckets in front of the restaurant and did some cleaning out in the gardens. The good news is that I got a lot done, the bad news is I almost wore myself out and then we had a record night at the restaurant. By the way…that’s a hint…if you want to come see us at The Artichoke on a weekend night you really need to make reservations! It was the toughest 14 hour day I’ve had in a long time (I did get to go home and shower). But we were thrilled that we had a fantastic night!. And we weren’t the only ones that were busy all weekend…there were boats on the lake and the entire area was buzzing with people! The Grand Lake season is upon us and it is looking pretty promising for another good summer. In fact, Memorial Day is coming early this year so you need to get those gardens and pots planted up for the first big holiday! Meanwhile take time to check out the irises. In the next couple of weeks they are going to really hit their bloom time. I love how they look and I love how they smell. Too bad they don’t have a longer season, but that is why summer annuals are needed to bloom all summer. Well, I have to say it again, this spring has been awesome so get out and dig it! And come and shop at the Saturday Morning Market from 9 to 1!